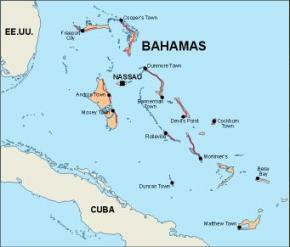 The Bahamas, officially the Commonwealth of the Bahamas, is a nation consisting of 29 islands, 661 cays, and 2,387 islets (rocks). 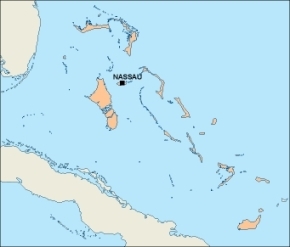 It is located in the Atlantic Ocean north of Cuba and Hispaniola (Dominican Republic and Haiti), northwest of the Turks and Caicos Islands, and southeast of the United States (nearest to the state of Florida). 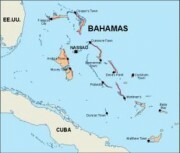 Its land area is 13,939 km2, with an estimated population of 330,000. Its capital is Nassau. 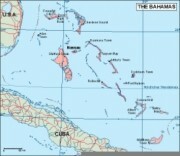 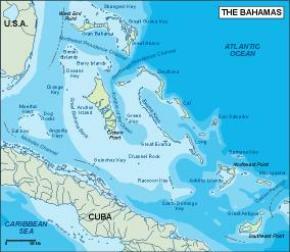 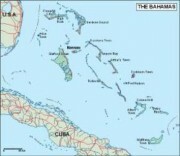 Geographically, The Bahamas lie in the same island chain as Cuba, Hispaniola and the Turks and Caicos Islands; the designation of Bahamas refers normally to the Commonwealth and not the geographic chain. In terms of GDP, the Bahamas is one of the richest countries in the Americas, (following Bermuda, The United States, Cayman Islands, Canada, and The British Virgin Islands) and one of the richest in the world whose population is predominantly of African origin.